I arrived a little early for my booking but that did not cause any problem as I settled into the lounge with a glass of champagne and started to absorb my surroundings. Barely settled, I was ushered to my table through the garden. 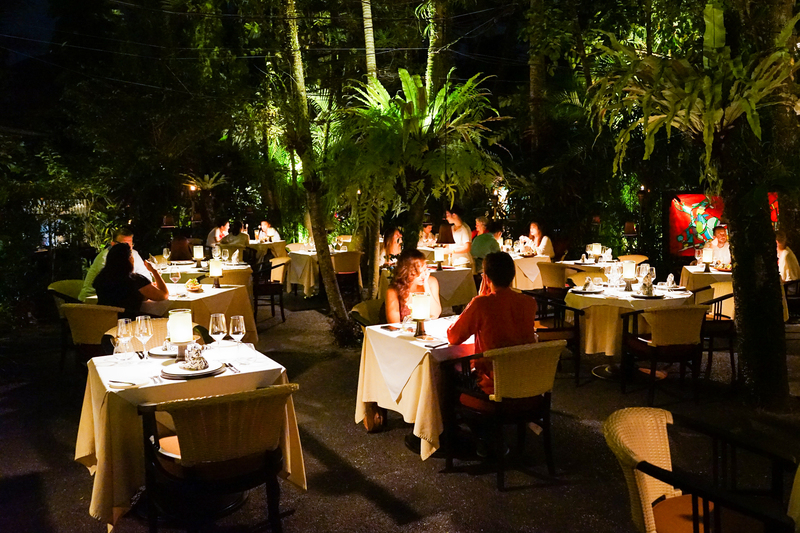 The bulk of the restaurant is located outdoors in the most divine garden setting I’ve seen in years. All the staff had a smile on their face and that vibe is simply infectious. The tables are lit by candles and are scattered around the garden in a pleasingly irregular way that lend to the feeling of space and privacy. However, I was led straight past these tables and round to the back of the garden where they had prepared the most romantically beautiful gazebo – simply stunning. The general manager of the restaurant came to introduce himself and after a brief conversation about the diverse menu, I decided on the “Local Farmers” menu with wine pairing. 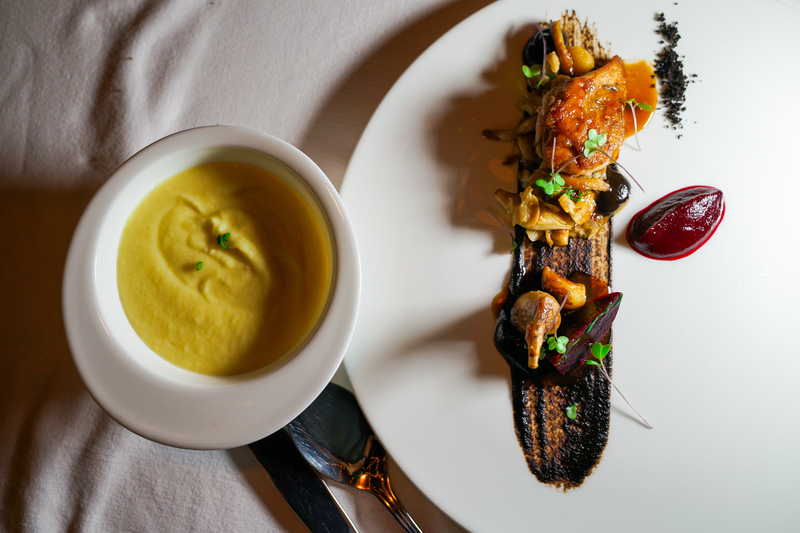 Mozaic is not a fusion cooking restaurant per se. Chef Chris Salans uses French cooking techniques and presentation with local market sourced ingredients. If the subtle smells drifting into the starry sky were anything to go by I was in for a treat. As always, the meal began with a selection of amuse bouches to help set the scene and give one a sense of the kitchen’s philosophy for the meal. A varied selection of beautifully presented dishes all of which were simply a visual and culinary feast! The first dish brought out was the Organic Tomato Tartar. 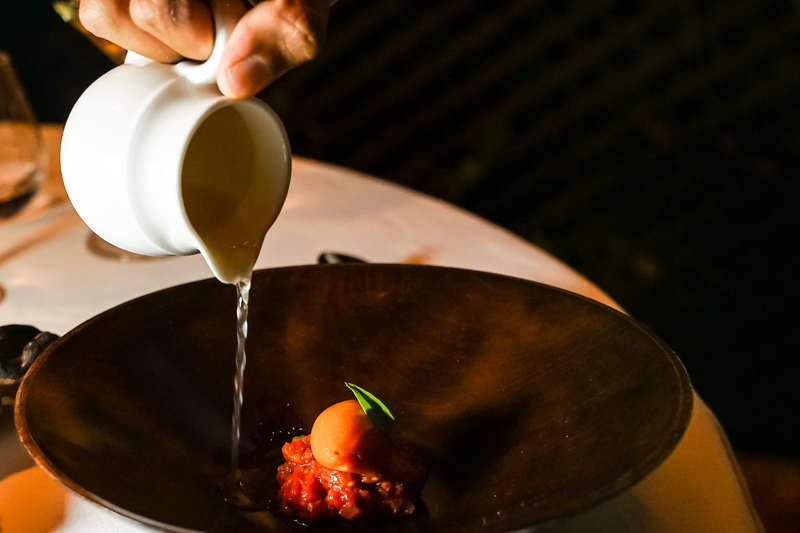 A wonderful tomato sorbet served with lemon grass water, kemangi leaf and dabu dabu vierge. I was instantly hooked. 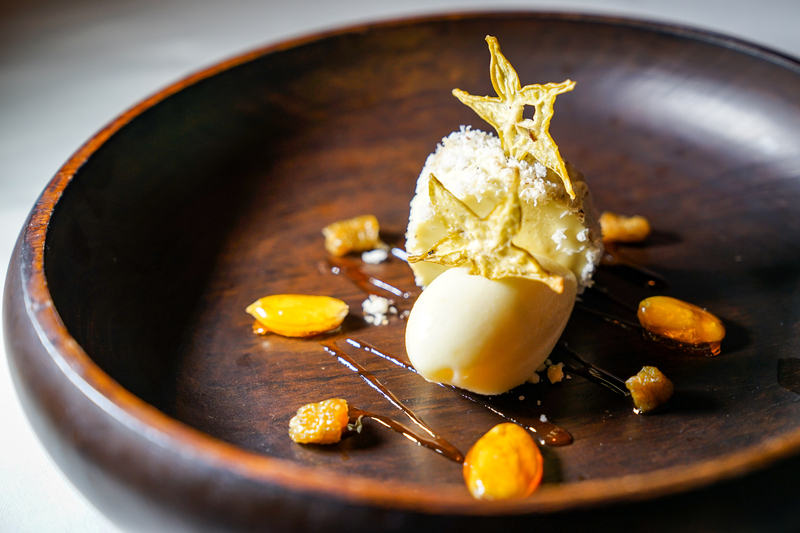 A beautifully presented dish with wonderful textures and flavours that contrasted and complemented each other perfectly – the perfect honeymooning couple sat under a starry sky in Bali. Experience has taught me that I shouldn’t fall in love so easily and so with the most neutral of expressions I sat and waited for the next dish. On the inside, however, the butterflies struggling to be constrained so. 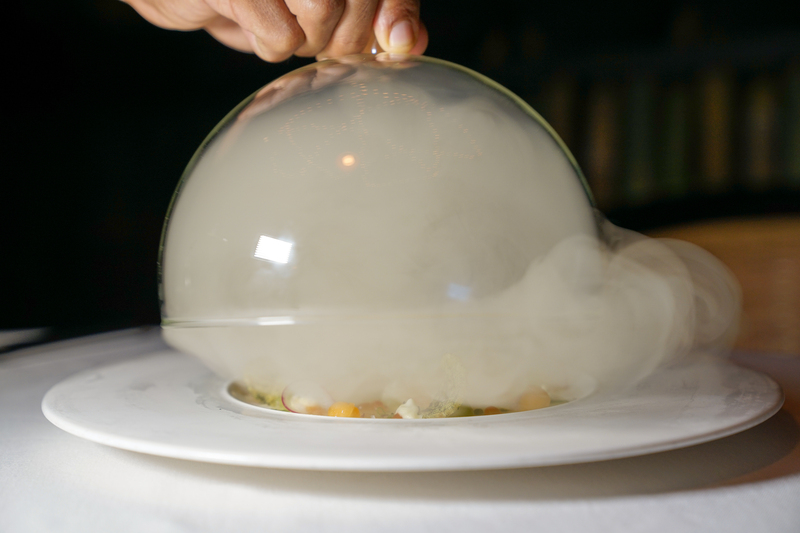 The next dish, Gindara Carpaccio, was served theatrically under a bell jar filled with dry ice. The effect was mesmerizing under the twinkle of the lights and by no means was the flavour and punchiness of the black cod with cumin leaf and seaweed crisps lost. If anything all the theatrical lead up did was to emphasize the crescendo of the perfectly orchestrated masterpiece that Chef Salans had created. Well, they for 2 for 2. However, I still maintained a little bit of suspicion. That was, until, in front of me was placed this most delicate, effeminate, vulnerably beautiful prawn. 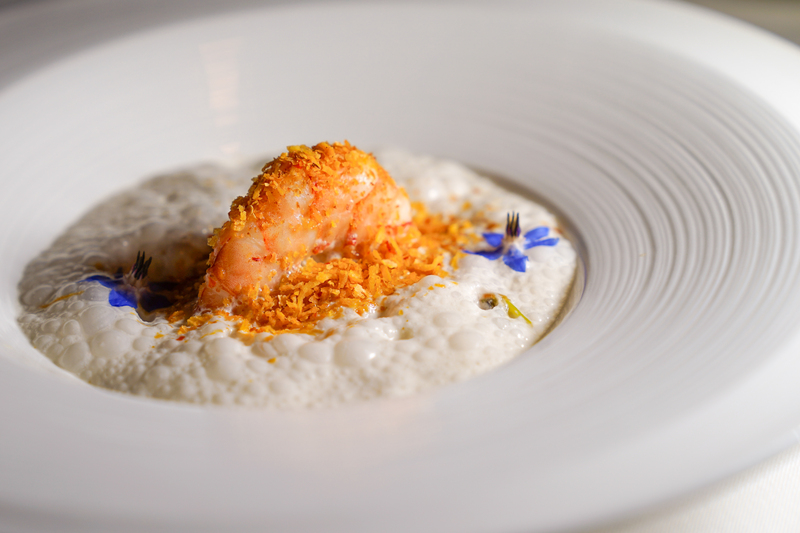 Clutching a little purple flower she, seductively, bathed in an aromatic coconut emulsion. She teased me and , as I gently raised her to my lips she did not put up a struggle. She longed me to do this – and after the first bite………love……..pure unabashed love. At this point, I had fallen in love with Mozaic. 5 courses to go and yet I was ready to declare this love. Course after course had me dancing around my gazebo with French music piped through the speaker under a starry balinese sky. From the playful Tuna Tataki, to the satisfying Kintamani Pork Press and Indian Ocean Octopus, to the wild and passionate Butter Roasted Javanese Quail and finally after the heated, steamy meal to the cooling Grape Sorbet and Kenari Nut Parfait – EVERYTHING was perfect……everything. For those who read these reviews often (thank you), you’ll know that I am very passionate about food but very critical too. For me to not find a fault often causes me suspicion in my own methodology and often results in a little time off from writing and reviewing until I am sure (thats the ‘Triple F’ factor) – and I am sure. Mozaic Restaurant in Bali is a ‘Perfect’ restaurant and is certainly a contender for the Fly For Foods Best Restaurant 2017 award. If you’re in Bali, heck even if you’re not, do yourself a favour and try Mozaic Restaurant.